Google has started rolling out a multiple account sign-in feature that makes it easier for users with more than one Google account to manage their online identities. The addition of the new feature means you no longer have to constantly log in and out of more than one Google account when using the same browser. The new feature doesn't work with all Google services, however, and other restrictions come with using multiple sign-ins. Here's what you need to know to get started. Can I use multiple sign-in with every Google service? No. At the moment, you can only use multiple Google account sign-in to use App Engine, Google Code, Google Calendar, Gmail, Google Reader, Sites and Voice. Multiple account sign-in for Google Docs is not ready yet, but will be coming soon. As more Google services support multiple sign-in, Google will add them to this list on Google's support pages. Any potential conflicts I should know about? Yes. Multiple sign-in will disable offline access to Gmail and Google Calendar, as well as any bookmark links you have to your offline accounts. Bottom line: if you want to keep offline access to Google services then don't use multiple account sign in. Also, Google gadgets in Gmail like Google Calendar or Google Docs will not work with the multiple accounts feature. How many accounts can I be signed into at once? Currently, Google allows you to use only three Google accounts at one time with the multiple sign-in feature. How do I activate multiple account sign in? First, keep in mind that Google is currently rolling out this feature so you may not have access yet. The easiest way to get started is to visit Google's multiple account sign-in settings page. 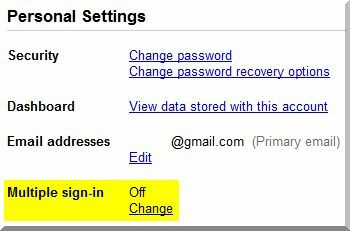 The other option is to click on "Settings">"Google Account settings" from Google.com. At the top of your Google Account page under "Personal Settings" you should see a listing for "Multiple sign-in." If you don't see that option, then the feature is not yet available for your account. If the multiple sign-in option is there, just click on "Change" and follow the instructions. Once multiple account sign-in is activated, a triangle will appear next to your e-mail address on the top right corner of the page. The feature is activated, now what? It's time to link the other Google accounts you want to use for this session. To sign into a second account, click on your e-mail address in the top right corner. You should now see a drop-down menu that will let you sign into another account. Repeat this step if you want to activate a third account. TIP: To sign into a second or third account from the drop-down menu, you must be using a Google product that supports multiple account sign-in like Gmail, Calendar or Reader. Let's say you're in Gmail and you want to switch accounts. Click on your e-mail address in the top right corner to activate the drop down menu and select the account you want to switch to next. What happens when I visit an unsupported Google service with multiple sign-in activated? The first account you sign into for a multiple account browsing session becomes your default account. Whenever you visit a Google service (such as Google Docs) that currently doesn't support multiple account sign-in, you will only be able to see the information for your default account. To view other accounts, you will have to sign out of Google Docs and sign back in under the other account. If you don't want to sign in and out, another option is to open up your second Google account in a different Web browser such as Google Chrome, Mozilla Firefox or Opera. You can also use Chrome's Incognito mode instead of opening a new browser, according to Google Operating System. This trick would probably work with the private browsing features in other browsers as well including Firefox, Internet Explorer and Safari. Multiple account sign-in is a great way to remove the hassle of dealing with multiple accounts. This is especially true for those of you who have paid Google Apps accounts at the office. With multiple account sign-in, Google Apps enterprise users can easily switch between their professional and personal accounts. It's not clear, however, how soon enterprise users will get access to this feature compared to other Google users. Sometimes, free users get access to new Google features sooner than paying customers do. But considering an enterprise-focused product like Google App Engine is one of the first services to work with multiple account sign-in, it's likely business users will be seeing this feature very soon.